There are right around 100 notes like this known to exist from all territorial banks. 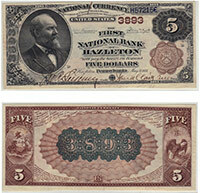 That actually makes it one of the more available notes from the first charter territorial series. The exact value really just depends on condition and bank of issue. Contact us for details. Don't forget to check the serial number. Number 1 notes always sell for nice premiums.